Aside from swinging in a hammock, snorkelling and diving, most visitors don’t do much else on Pulau Weh primarily because there isn’t that much to do. One good way to leave the hammock for a day is to rent a motorbike and take a trip around the island. Pulau Weh is a large island and it takes about two hours at a leisurely pace to ride from one side of the island to the other. Aside from sensational winding roads to test your motorbike skills on, there are plenty of fantastic viewpoints, secluded beaches and a few attractions to keep you interested. 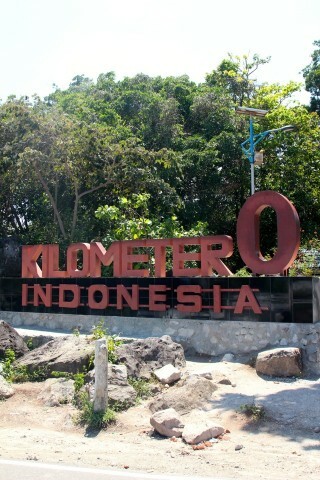 Kilometre 0 is the figurative starting point of the Indonesian archipelago and is a feature in Indonesian sayings and songs. The Indonesian archipelago actually starts further out to sea and is widely acknowledged as such, but nobody really cares as long as you can get a photo in front of the sign which proclaims this as the westernmost point in Indonesia. In the general area, there’s a big ugly monument, some warungs and great views across to a few islands further afield and the greater Indian Ocean. If you’re lucky you’ll spot a few elusive bush pigs which occasionally wander out of the forest. KM0 is eight kilometres from Iboih and only accessible by private transport. A volcano of passing interesting pokes from the middle of Pulau Weh. You can smell the volcano long before you see it as its main activity seems to be spewing out hot sulphurous fumes. When you arrive at the active edge of the volcano, you’re simply greeted by a bunch of rocks -- but the rocks are often hot and often leaking gas. We’re told that it’s safe here and we didn’t find the fumes too overwhelming, but make sure you wear decent footwear and not flip flops if bounding across the rocks. This is a bit of a B-grade attraction and it’s no big deal if you miss it. But if you want to make a daytrip of your motorcycle journey, head along the southern road through the island until you reach the sign pointing the way. The east coast is full of secluded white-sand beaches perfect for a dip. Head east of the ferry port and along the east coast road and just stop as your mood takes you. Freddie’s is also located on the east coast and is one of the best places for a feed on the entire island. Motorcycles are for hire at most guesthouses and from many people hanging around in the streets for 100,000 rupiah per day. It’s highly recommended that you choose a motorbike that is relatively new as the the steep roads require a strong engine and even stronger brakes.